All voters in the District will be able to vote for two at-large candidates. There are seven candidates running, including two incumbents. WASHINGTON – With 75 percent of registered voters in the District identifying as Democrats, the outcome of the presidential election in the nation’s capital likely will be no surprise. But the city still boasts important races and questions on its ballots, with voters poised to decide on members of the D.C. Council and issues related to the ethics of their elected politicians. Voters may choose two of the seven candidates, but only one Democrat can be elected due to a provision in the D.C. Home Rule Charter requiring that two at-large seats be held by non-majority party members. All District voters also will be able to vote in the special election for chairman of the D.C. Council. Current Chairman Phil Mendelson, a Democrat who was appointed to the seat by his council colleagues after the resignation of Kwame Brown, is running against Democratic challenger Calvin Gurley. The winner will serve out the remaining two years of Brown’s term. Mendelson has been an at-large councilmember since 1998, while Gurley is a longtime federal employee and civic activist whose family has deep roots in the District. Question 5: Asks voters to give the D.C. Council the power to expel a member of the council for “gross misconduct.” Expulsion would require 11 of the 13 members to vote “Yes.” Members of the council currently have very little authority to reprimand one of their own. Questions 6 and 7: Question 6 would make anyone convicted of a felony while in office as a councilmember ineligible stay in office and to ever hold that office again. Question 7 would do the same for anyone holding the office of mayor and convicted of a felony. All three questions have sparked controversy. On Question 5, many critics believe a five-sixths majority for expulsion is too high of a threshold. On questions 6 and 7, many believe the D.C. Board of Elections and Ethics exceeded the intent of the council when writing the ballot language. Mendelson has said he thinks the ban from office was not supposed to be a lifetime ban. Additionally, many critics point out that while a councilmember convicted of a felony while in office could not run for council again, he or she could run for mayor, and vice versa. Also, because the language says “convicted while in office,” elected officials facing indictment could simply resign before being convicted – as former councilmembers Kwame Brown and Harry Thomas Jr. both did – and then be eligible to hold office again. Eleanor Holmes Norton, a Democrat and D.C.’s delegate to the House of Representatives, is running against two challengers – Libertarian Bruce Majors and Statehood Green candidate Natale Lino Stracuzzi – in an effort to keep her non-voting seat in Congress. Voters also will choose a shadow senator and shadow representative, both of which are largely ceremonial positions that carry no power. Other ballot questions: Va., D.C. 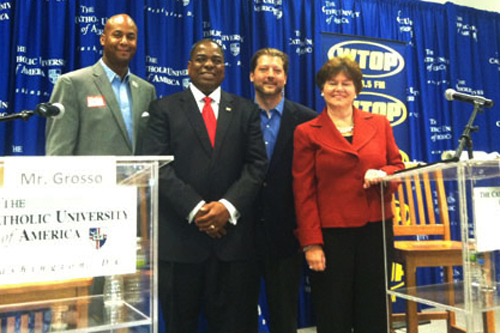 Follow Mark Segraves and WTOP on Twitter.